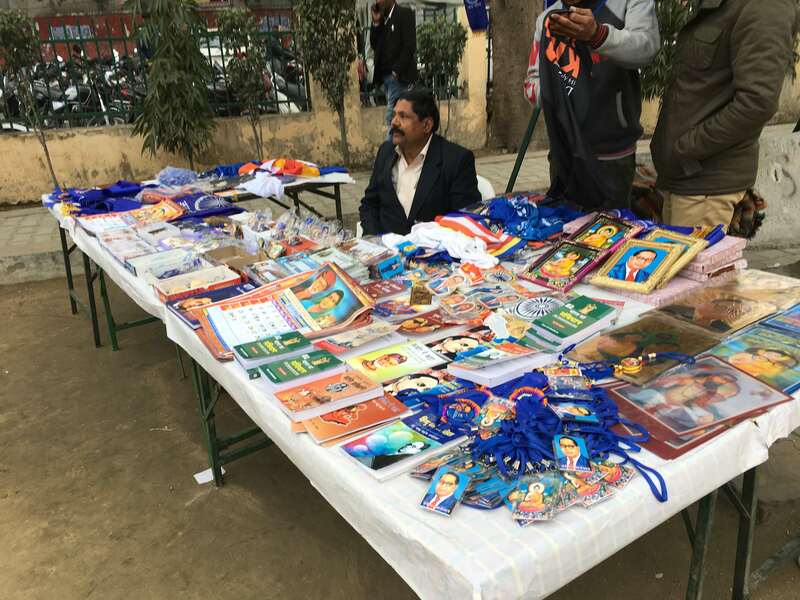 Dalit and Muslim organisations gathered this week in Meerut to demand the release of the Bhim Army leader, who has been languishing in jail after the Adityanath government slapped charges against him under the National Security Act. 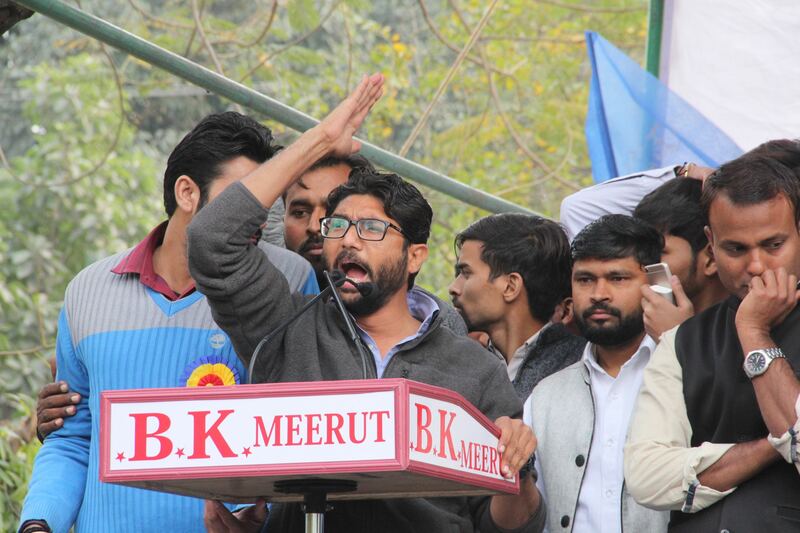 Meerut: On a cold, damp, and windy Monday afternoon in Meerut, Jignesh Mevani, recently elected MLA from Vadgam in Gujarat, demanded the release of Bhim Army leader, Chandrashekhar Azad, who has been languishing in jail since June 2017. Mevani, speaking to a large crowd gathered outside the Meerut divisional commissioner’s office, termed Azad’s continuing detention ‘politically motivated’. “It is only because Chandrashekhar has raised real issues that he is behind bars. He has asked questions that Yogi (Adityanath, Uttar Pradesh CM) and (PM Narendra) Modi don’t have answers to,” he said to a receptive and loud audience. “You must vow that if Chandrashekhar is not released before April 1, you will stop Yogi’s convoy and not let him touch Baba Saheb’s (Bhim Rao Ambedkar’s) statue on April 14 (Ambedkar’s birth anniversary),” Mevani said amidst loud chants of ‘Jai Bhim’. After caste-related violence broke out in Saharanpur in May 2017, Azad and several others were booked in 27 separate cases. In November, however, the Allahabad high court granted bail to the Bhim Army leader noting that the charges were politically motivated. A day later, the Uttar Pradesh government booked Azad under the draconian National Security Act (NSA), using which the state can place any citizen under preventive detention without legal recourse. When the initial applicability of the NSA expired on February 2, the state decided to extend the application of NSA on Azad by another three months, meaning that he could be in jail till early May despite having been granted bail by the high court. Addressing the gathering, organised by the Meerut-based Democratic Student’s Front (DSF), Mevani lambasted the Adityanath government for keeping Azad under preventive detention. “The Karni Sena is allowed to assault school children. While, a man (Azad) who was working to educate the children of marginalised and oppressed communities, is called a threat to national security and put behind bars,” Mevani said. People from across western UP had gathered for the protest meeting at Meerut’s Chaudhary Charan Singh park, where farmer leader Mahendra Singh Tikait famously laid siege for 25 days in 1987. Seated in the first row and listening with rapt attention were a group of nine women — the only women in the crowd — who had travelled 30 kilometres to be part of the protest. “Chandrashekhar ne umeed jagayi hai hum logon mein ki humare haq ki ladayi hum khud lad sakte hain. Usko jail se chhudane ke liye Lucknow bhi jana hoga to hum jayenge (Chandrashekhar has given us hope that we can fight for our rights on our own. Even if we have to go to Lucknow to free him from jail, we will go),” said Om Vati (55) who works as an agricultural labourer. 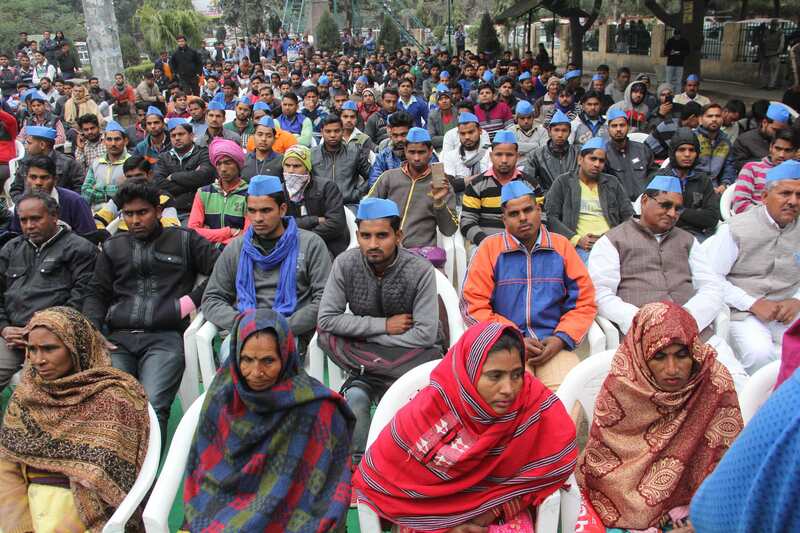 Also present at the gathering were youngsters in large numbers — substantially loud, colourfully dressed, and wearing blue Gandhi caps. The colour blue is associated with Dalit movements as B.R Ambedkar — the rallying focal point for Dalit movements — wore blue for much of his life. Aadesh Gautam (22) came to the protest with half his face painted blue. “Blue is the symbol of our fight for our rights. Everyone was wearing blue caps, so I thought I will do something different and decided to paint half my face blue,” he said before breaking into loud chants of ‘Jai Bhim’ along with his group of friends who had travelled with him from their village of Kurali, 30 kilometres away. The meeting witnessed a coming together of several Dalit and Muslim organisations, who batted for Dalit-Muslim unity in the face of ‘increasing oppression’. The organisers had consciously invited Muslim organisations to be a part of the protest. “It is important for Dalits and Muslims to come together at this point. Both communities have been oppressed by this Brahmanvadi (ideology that believes in the superiority of Brahmans) BJP government. We will be much stronger, if we stand united. That is why we extended an invitation to our Muslim brothers to join us at this event. And they will continue to be an integral part of our movement in the future,” said Sushil Gautam, president of the DSF. Mevani, too, took the opportunity to stress the importance of Dalit-Muslim unity citing the example of his own election from Vadgam. “Vijay Rupani (Gujarat chief minister) and Yogi Adityanath campaigned against me in my constituency. Narendra Modi and Amit Shah campaigned in the constituency next door. Yet, I was able to win by 20,000 thousand votes. This was possible only because Dalits and Muslims stood united,” he said. “If Muslims and Dalits come together, then Yogi will not be chief minister and Modi will not be Prime Minister,” Mevani added. According to Chandra Bhan Prasad, noted writer and Dalit thinker, the situation is ripe for Dalits and Muslims to come together to create a substantial electoral constituency which will be difficult to ignore. “There are around 400 Lok Sabha constituencies where Dalits and Muslims combined constitute 30% of the electorate. Also bear in mind, that 90-95% of Dalits and Muslims go out and vote. So, if they are able to come together, they become significant electorally. And I feel, that there is a great desire among Dalits and Muslims —particularly the youth — to come together,” he said. Satish Prakash, Dalit intellectual and political activist, believes that if Dalits and Muslims have to come together, western UP is the ideal place to start from. “The soil of Meerut and rest of western UP breeds rebellion. There is a long history of great agitations which have started from here. Also, Dalits are economically more secure in this region and, therefore, are out to fight for their rights. Muslims also form a substantial chunk of the population here. So, if Dalits and Muslims can coordinate and come together as one, it will be a force to reckon with,” he said. However, for Dalit-Muslim unity to be electorally significant and to ensure that votes are not divided, grand alliances along the lines of the Bihar Mahagatbandhan will have to be formed, which could prove a formidable challenge. In UP, for instance, it would require arch-rivals Bahujan Samaj Party and Samajwadi Party to come together in a pre-poll alliance — a proposition that seems unlikely. Prasad concedes that this will prove to be a challenge. “That is definitely a problem. It would require a great deal of political unity. But, it is not impossible,” he said.